A mom shares a heartbreaking video of her last few words to her son. 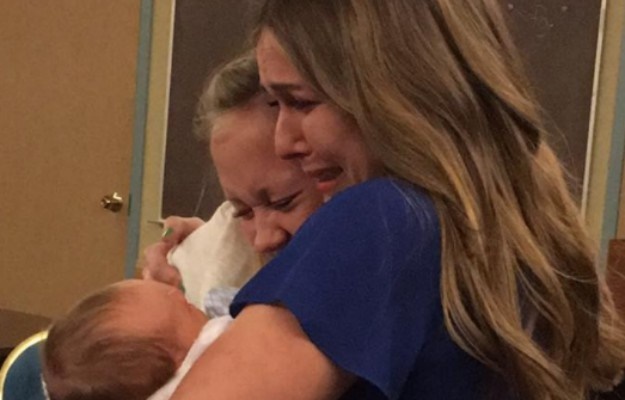 A mom shares a heartbreaking video of her last few words to her son just hours before his adoption was made official. Hannah Mongie, from Utah in America, was only 18 years old when she learnt she was pregnant. After the sudden death of her boyfriend, Kaden Whitney, Hannah made the tough decision to place her baby boy up for adoption, reports ABC News. Just two days after giving to healthy little Taggart, the new mom recorded a touching video from her hospital bed explaining why she chose another family to raise him. “This is for you, Tagg,” Hannah says. “I made this video so that you know how much I love you. Hannah went on to say she had a hard time making her decision as he reminded her so much of Kaden, who had died in his sleep. The now 21-year-old revealed to Scary Mommy that she’d read through many adoption applications before she stumbled across a couple, Brad and Emily Marsh, with whom she “fell in love”. “There was just something about them. I read their letter and what they said about birth moms and I just cried, and something told me this was it,” she says. The couple welcomed Taggert into their family, which already included an older adopted son, Carter, in March 2016. Brad and Emily are still in contact with the birth moms of both their sons. “Our birth moms are kind of put on a pedestal at our house,” says Emily. Hannah often babysits for the family and is grateful the Marshes were willing to accept her into their family. “It’s the biggest blessing in my entire life that they’ve been willing to accept me in their family,” says Hannah. The video was posted on Facebook and has racked up more than 2,4 million views. “I never thought more than a handful of people would see it. I’m blown away by the response,” she says.